Laser treatments have revolutionized medical care in many different specialties, and now, it is changing the way that your dentist provides treatment. Laser dentistry , such as the Waterlase system, offers many advantages over traditional dental treatments, allowing you to get the care you need more comfortably and faster than ever before. Here are just some of the reasons patients are smiling about laser dentistry. If you’re someone who gets nervous about seeing your dentist, then you’ll be excited to know that laser dentistry is the most comfortable way to get treatment . Laser dentistry uses laser energy and water to get results, so you don’t have to worry about the heat, pressure, and vibrations that come with traditional treatments using drills. In many cases, patients can get laser dentistry care without anesthesia, and when anesthesia is necessary, less is required. That means you could get the dental care you need without the dreaded numbing shot. Laser dentistry lets your dentist perform treatments that used to take multiple visits during a single appointment, saving you time and money. Your appointment time can be reduced even more if anesthesia is not needed. Laser treatments let you get out of your appointment and back to your to-do list quicker than other kinds of care. Laser treatments allow for greater precision than other kinds of care. Any cutting that is required is smaller and more conservative than other treatments, and the laser causes the blood to coagulate quickly. As a result, you’ll experience less gum swelling and bleeding and less post-treatment discomfort. If you don’t need anesthesia, you will also get to skip the post-procedure numbness that lingers for so long with other treatments. Glenwood Premier Dental is pleased to offer Waterlase laser dentistry in Hazlet for restorative care, including treatment of cavities, surface etching, and enameloplasty. Find out if laser dentistry could be right for you and make an appointment at our dental office by calling (732) 264-4477. One of the most important parts of your dental checkup occurs when your dentist examines your gums for signs of disease. Gum disease can cause significant issues for not just your oral health but your overall well-being as well. 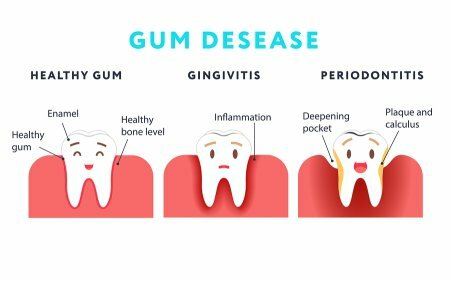 If you have gum disease, your dentist may diagnose you with gingivitis or periodontitis, but what is the difference between the two conditions? Gingivitis is the earliest stage of gum disease. Improving your oral hygiene habits, such as more frequent brushing and flossing, can typically reverse it. Periodontitis is the second stage of gum disease, which occurs if gingivitis is not treated. With periodontitis, tooth roots and the bones in the jaw that support the teeth may be affected, which can lead to tooth loss. At Glenwood Premier Dental, we can help you fight back against gum disease in Hazlet with scaling and planing cleanings and periodontal surgery. To make an appointment, call our dental office at (732) 264-4477. When tooth decay destroys a portion of your tooth and a filling is not sufficient to replace it, you may need a root canal followed by a crown. If your dentist suggests a crown, Captek™ crowns will provide a natural look and feel that is both comfortable and durable. Watch this video to learn more about the benefits of Captek™ crowns. These crowns offer reliable biocompatibility and strength, while giving the appearance of natural teeth. They won’t create a dark line along your gums like other crowns, and they have been shown to be more resistant to bacteria than natural teeth. Glenwood Premier Dental is pleased to offer Captek™ crowns alongside other high-tech treatments for restorative care and oral health. Make an appointment with our dentist in Hazlet today by calling (732) 264-4477. If you’ve fallen behind on regular dental exams , you’re not alone. People avoid going to the dentist regularly for a number of different reasons, from financial worries to dental phobia. Some people simply miss so many appointments that they’re embarrassed to see their dentist again. Whatever your reason is for missing dental exams, the time to get back into the chair is now. You may be surprised at how easy it is to get back into the swing of a good oral health regime. Here are some of the reasons you should make an appointment with your dentist today. Dental health issues get worse. Unfortunately, if you have an oral health problem , it is not likely to run its course the way a cold or stomach bug bite would. Tooth decay, gum disease, and other oral health issues are almost always progressive, so the longer you wait for treatment, the more care you will actually need. By getting to your dentist, you can find out if you have any oral health problems that need to be addressed and often get less invasive—and less expensive–treatment than you might need if you postpone it for another six months. Your dentist isn’t mad at you. Dentists understand that life is busy and that some people dread dental exams. He or she isn’t going to lecture you or scold you for being behind on teeth cleanings. 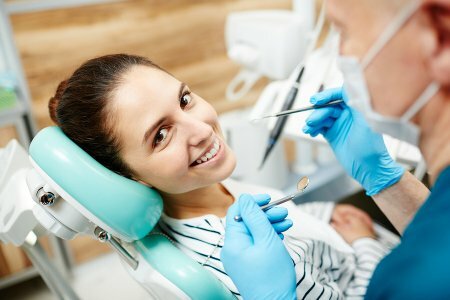 Instead, your dentist and the entire team at your dental practice are ready to help you get back on track comfortably, as they have done with plenty of other patients in the past. Paying for dental services can seem overwhelming, but you may be surprised at how many options are available for financing your care. Talk to the staff at your dental office about your situation, and they will help you get the care you need at a price you can afford. At Glenwood Premier Dental, we promise a lecture-free, judgment-free appointment, no matter when your last teeth cleaning was. Let us help you get back on the road to good oral health by making an appointment with our dentist in Hazlet. Schedule your visit by calling (732) 264-4477.